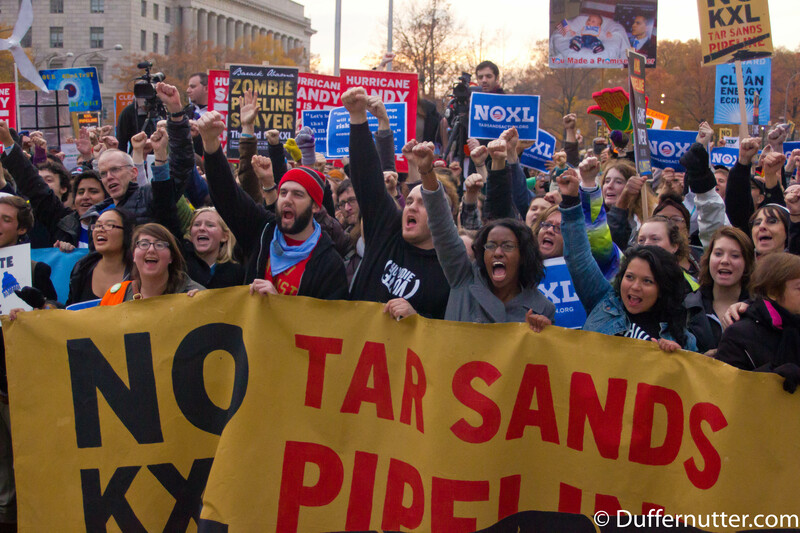 Activists from more than fifty universities issue an open invitation to a March 2 Keystone XL protest in DC. This manifesto was originally signed by fifty students from fifty different US colleges and universities and was released as an open invitation to a March 2 Keystone XL protest in DC. For a handful of multimillionaires, Keystone XL would be a dream come true. Koch Industries alone expects to rake in $100 billion if it is built, which for perspective, is as much as the federal government spends annually on education. Yet for us, a generation of young people awaiting its future, the pipeline would be a nightmare. The Keystone XL pipeline, if approved, would carry over 800,000 barrels of tar sands oil—best described as a semi-viscous, carbon intensive, toxic injustice—through America’s heartland each day. Tar sands oil is a disaster at the point of extraction, where it causes cancer rates to spike and destroys local ecosystems, all the while violating the treaty rights of Canadian First Nations. It is a disaster when transported, as both the recent railroad crash in Quebec and pipeline spill in Arkansas have made strikingly clear. It is a disaster when refined, exacerbating cancer and asthma clusters and doing so mostly in low-income neighborhoods and communities of color. And tar sands oil is an absolute disaster at the final stage, when power plants burn it and dump the carbon pollution into our skies. This carbon serves to further destabilize our imperiled atmosphere, threatening society with one of the greatest crises it has ever faced. The decision on Keystone XL will be the definitive test of President Obama’s character and integrity. Moreover, it will be a crucial arbiter of his legacy, impacting history’s verdict on his presidency far more than incidents such as the Benghazi affair or the NSA ordeal could. We are asking that question of the president today. We ask because President Obama’s willingness to govern in an environmentally responsible manner has been called into question. At Georgetown, President Obama promised to review the pipeline based on whether it would have a significant impact on the climate. But in the months since that speech, the State Department has continued to rely on ERM (a dues-paying member of the American Petroleum Institute) to run the environmental review of the pipeline. That’s despite the fact that ERM has a close business relationship with TransCanada and that it was later caught red-handed for lying to the State Department in order to cover up those business connections. President Obama has indeed made several responsible choices, such as increasing the mileage standards for cars. But he has also made some disastrous ones. He opened vast swaths of Western lands for coal mining, repeatedly endorsed an “all-of-the-above” energy approach, and even supported the Southern leg of the Keystone pipeline. We know that if we sit back and trust him to independently make the right choices, we will be doing so at our peril. We have therefore decided to act. Rejecting Keystone XL will help keep the tar sands where they belong, buried safely in the ground. It will protect communities that are already struggling to survive. And it will send a resounding message that the days of unchecked fossil fuel recklessness are coming to an end. On March 2, throngs of young people from around the country will converge at Georgetown University to demand that President Obama follows through on the promise he made there during his speech. From Georgetown, we will march to the White House. When we get there we will have a huge rally featuring speakers from communities that are at the frontlines of the fight against tar sands oil. We will proceed to engage in an act of peaceful and principled civil disobedience at the White House gate. We hope that this action will set the record for the largest single-day act of civil disobedience at the White House in American history. You will learn about the exact details soon, but for now we can say that this will be different from previous White House protests. Emboldened by our passion and our frustration, we will partake in an unprecedented action to denounce the Keystone XL pipeline and the “all-of-the-above” energy approach that makes such fossil fuel projects possible. We are young, awaiting a future fraught with uncertainty. This will not deter us from participating in an act of civil disobedience. Indeed, it has compelled us to organize one. We ask you to join us in Washington, DC on Sunday, March 2 for this action.